Here’s another piece from a few years back, a watercolour done at Swansea Print Workshop’s life drawing group onto an A3 spiral bound Cotman watercolour pad. 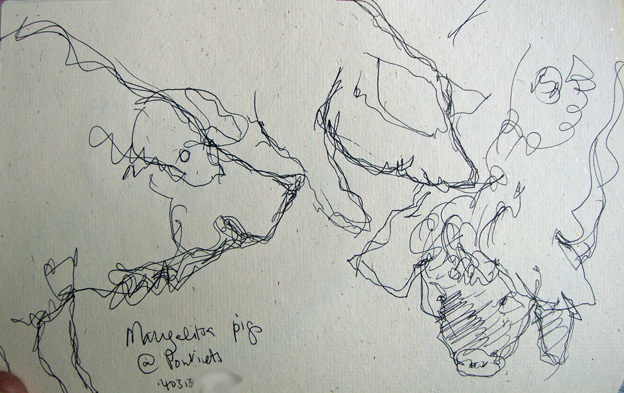 Husb and I visited some friends on a small farm in Pontyates yesterday and I drew their pigs. They have three Mangalitzas billeted in their woodland, two of them showed up for their barley and hay snackage; the ginger one was shy and stayed away. 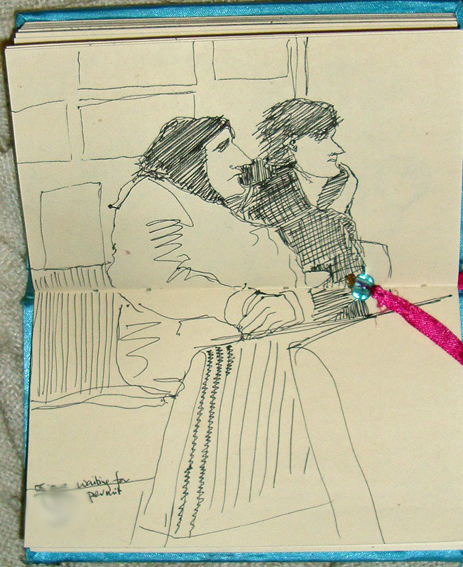 I scribbled the other two who are very different to the little Berkshires I blogged yesterday. They’re much bigger and very, very hairy. One of them was positively curly! This made it harder to draw any detail on them but they lent themselves to my very scribbly style. Pontyates is a small Welsh-speaking village West of Llanelli with a fish and chip shop. Dot Cotton, from East Enders, was evacuated to Pontyates during the war and one of its most famous daughters is Mandy Rice-Davies who was involved in the Profumo scandal. These Mangalitzas are European curly-haired hogs, descended from wild boar and mainly kept for lard. But because people aren’t so keen on lard anymore, they’re now classified as a rare breed. Bring back Lardy Cake, I say! 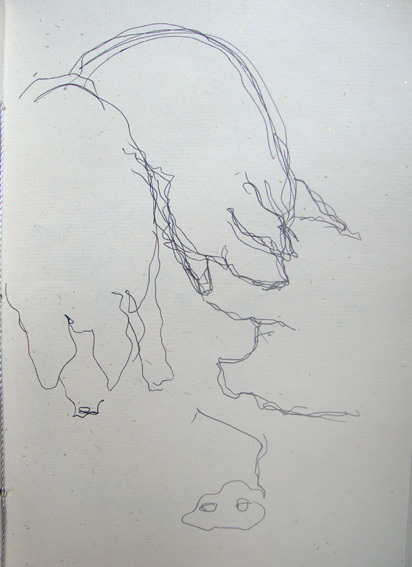 These are destined to be little tiny drypoint etchings, scribbled into paper drypoint plates. I was walking back throught the city centre this afternoon and revellers were already piling into Wind Street, Swansea’s notorious nightclub area. I wandered behind a group of women celebrating a birthday and got a close up view of legs staggering along on ridiculously high heels, making them look very muscly and quite bandy. I stumbled along with my bags of groceries, scribbling as I went. I couldn’t work out where they kept their money. Still wrapped up in a blankie indoors getting more and more fed up, which probably means I’m on the mend. I’m fed up drawing the cats and fed up with my drawing pens so I had a scribble with Ming The Merciless into a larger A3 sketchbook and used some Derwent Academy watercolour pencils for the scribbling action. Now I’m not a big fan of pencils, or watercolours, but it’s a good exercise to break out of your comfort zone occasionally. Derwent makes its pencils in the lovely Lake District town of Keswick and it is the home of the national pencil museum. Seriously, it’s a great place with the country’s longest pencil, some World War II RAF covert pencils and a factory shop. It’s brilliant. And so’s the Lake District. 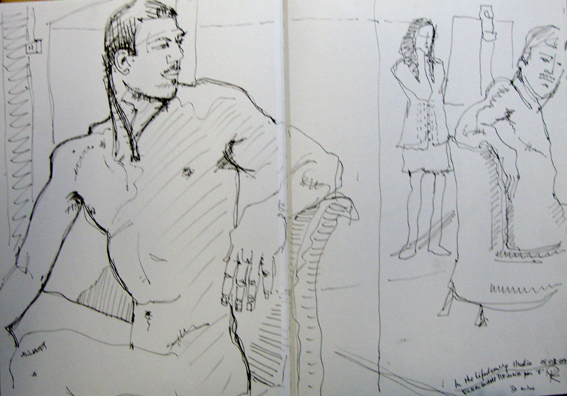 It’s a season of new models at our life drawing group; a new female model last week and a new male this week. 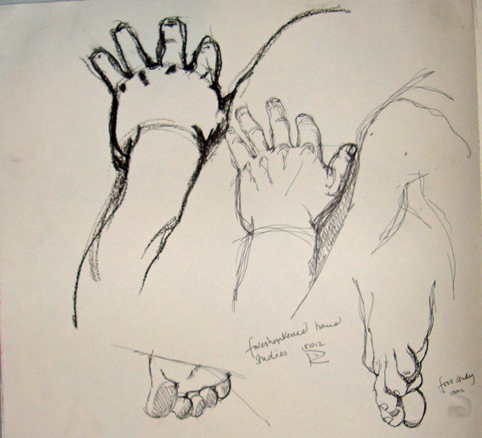 I had fun with the pastels then did some smaller studies of his hands and feet. It was a one hour pose with some serious foreshortening – I’m a glutton for punishment. Has a very productive day in the studio and did lots of preliminary drawings for a very large piece I’m working on for an international painting competition, BEEP. The deadline is the end of next week so I’m working flat out. 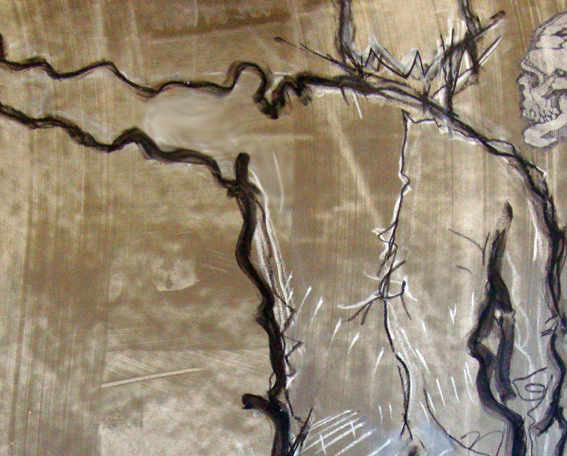 I’m not a painter but BEEP wants artists to challenge traditional notions of painting, so I’m approaching it as a scribbler and printmaker, constructing it mostly using printmaking equipment – squeegees and rollers – and also drawing into it extensively with oil bars. Husb and I went to Taliesin Arts Centre this evening to watch the Dave McKean directed film, The Gospel of Us, featuring Michael Sheen. It’s extraordinary, moving, powerful and the visual quality is superb. I’ve long been a fan of McKean’s comic book art and his film collaborations with Neil Gaiman. This is very much an independent art film type of thing so I’m not sure how widespread it’s cinema release will be, but it’s worth tracking down. 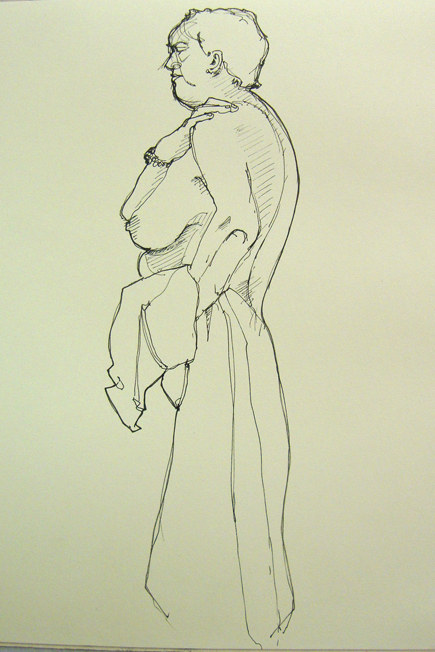 The drawing above is one I did last week of an older female model. 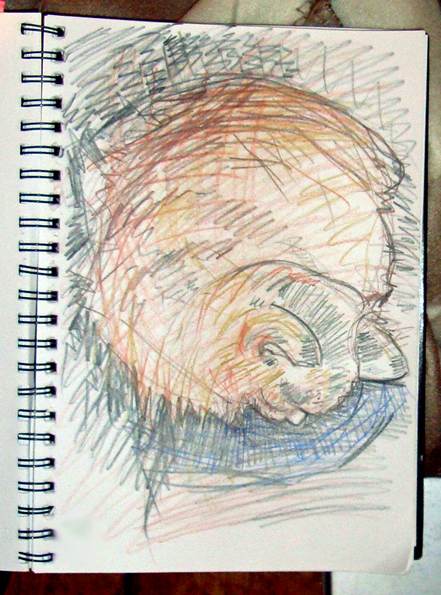 It took about ten minutes and it’s in Faber Castell Pitt pen into a Bockingford sketchbook. I like the composition very much, especially the way the drapery falls and I might reconstruct this as a scaled-up drawing ready for turning into a monotype. Here’s one of our younger models in a pose reflected in the large mirrors in the drawing studio at Swansea Print Workshop. I like to put the model in the context of the space and show what’s going on around. What I particularly like about this one is that the model is a man and the artist reflected in the mirror is a woman, which reverses a lot of people’s expectations. 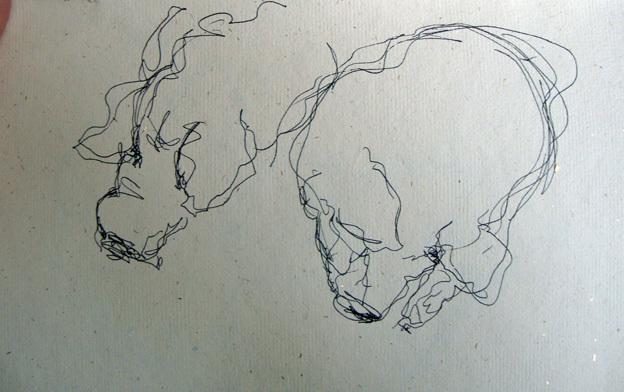 Life drawing can be quite controversial outside Western Europe – and even within it. I think part of that may be down to the history of art modelling and art, when most [almost all] artists were men and most models were women, considered just a little step above prostitution. Now it’s a credible career choice and we have models from all sorts of backgrounds, none of them exploitative and of course, women are now allowed to be artists. 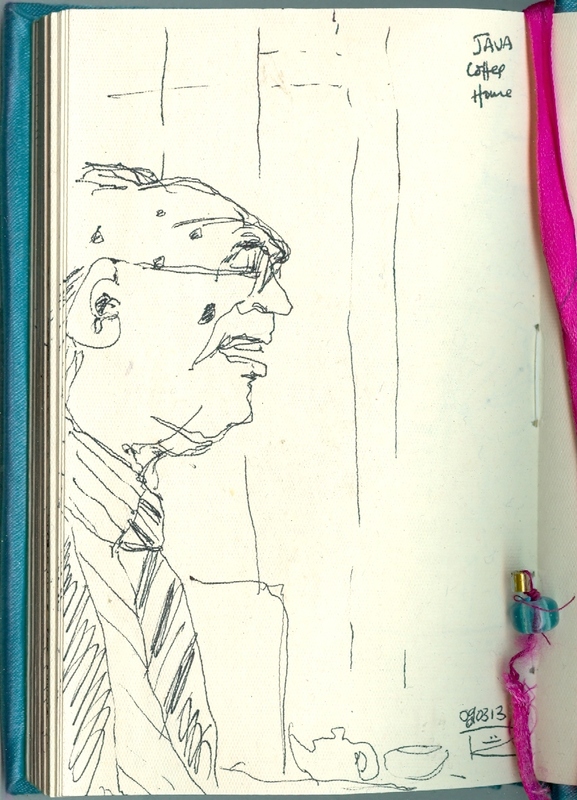 The drawing is in Faber Castell Pitt pens into an A3 sketchbook, drawn across both pages. Mixed media: work in progress. Sometimes when you’re drawing you get into the physical act of it, where you’re not just trying to create an image of something, but you’re also getting into the beauty of the mark. 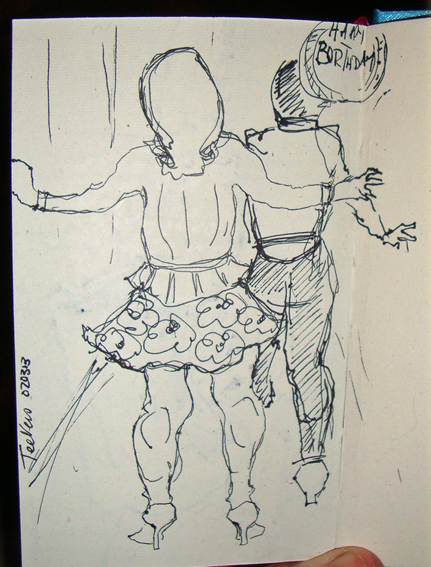 I had one of those moments earlier today when I was working on a large drawing in the studio. This started life as a life drawing in my sketchbook and has been through a couple of incarnations as a direct line monotype and more recently as a large three-colour monotype. I really like the original image so I decided to work it up as a very large drawing which will probably be the basis for a mixed media piece that I’ll work on after Xmas. I started off with a large piece of Fabriano 350gsm that I’d previously coated with an acrylic ink / medium mixture, applying it randomly with a squeegee. I started to work up the drawing in black and white conté crayons and then went over the black lines with a transparent oil bar. The bar made the conté line semi-liquid and it flowed beautifully. I got right into the physicality of it and when I stood back to look at it, the line wasn’t at all true to nature but nevertheless it’s a gorgeous, sensual, lush line. In my humble opinion. Sometimes that’s enough.